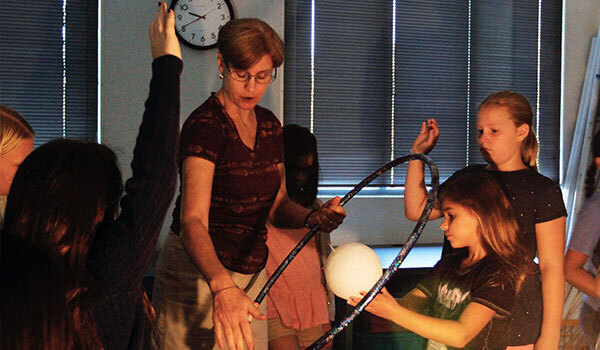 What makes our Lower School science program so unique? Find out in this interview with Lower School Science teacher Tracy Hoffman, who explains the Westridge difference in STEM in an all-girls' environment. What are your goals for Lower School science? For the girls to learn fundamental skills they can use in higher level science, of course, but on an even broader scale to figure out how to problem-solve. I want them to learn how to think and to have confidence to do science and take other risks. I want them to learn that making mistakes is a really key part of science. In science it’s not about the right answer, but how did I get this answer and what does this answer tell me about how something works. My philosophy is that when you make a mistake, you reframe your questions, figure out what you could alter to find a more accurate or compelling answer. What makes LS science unique at Westridge? Number one is the frequency. I have the girls every other day for an hour, which is amazing. Then there is the curriculum, which I created. It is aligned with the Next Generation Science Standards, so the girls are learning grade-level appropriate concepts and skills, but we’re learning it in a hands-on, investigative fashion. I provide them background on vocabulary and concepts, and then we do activities to explore the concepts so the girls can determine for themselves the meaning of those concepts. We pretty much do hands-on work in every class period. Can you give us a snapshot insight into what your students might learn in any one of your classes? Sure! One very fun project in the 6th grade involves studying plate tectonics by modeling earthquakes, and then building and testing (on shake tables!) earthquake-resistant structures. They derive rules for what makes an earthquake-resistant building. Fourth graders learn the basic skills to do science in my class. We discuss the scientific method, formulating hypotheses, and they learn measurement skills. We also hold our own Mini Metric Olympics (see last’s year Olympics here). The 4th grade also learns to identify simple machines (wheels, gears, lever, etc.) within complex machines. They study how each of these things helps to make work (moving mass over a distance) easier - so how can we move things more easily. They make and test their own machines with the unit culminating in an activity call Gadget Anatomy. How is teaching and learning science different in an all-girls’ environment? As a student, I attended both co-ed and all-girls’ schools, and I found that the advantage was having a less stressful environment. Having all girls takes away a set of confounding stressors. The way I teach isn’t altered because I am at a girls’ school – it is more that because I am at an all-girls’ school, there is an opportunity for girls to feel more comfortable expressing an interest in science. It is an opportunity to make science more accessible, to be just another area of interest… It removes cultural stigma and obstacles in your way to considering science as a viable option for your future. Who are your favorite scientists? The one that I think about most frequently is Rosalind Franklin, the co-discoverer of the structure of DNA. Watson, Crick, and her male colleague Wilkins received the 1962 Nobel Prize, four years after her death. Although she was an equal contributor and collaborator, when they published, she was treated more as an assistant than as a collaborator. Now, people recognize the magnitude of her contributions. I also really like Neil deGrasse Tyson because he is doing what I am trying to do in the sense that he is making science accessible. He is not dumbing down the science. He is an incredibly good scientist, who is breaking down complex concepts into palatable pieces so the general audience can gain some accessibility to science. Your career started in laboratory research and in the biotech sector. How did you become interested in teaching? I teach because I feel our society needs a scientifically literate population. When I worked (in training) in biotech, I taught a course for our non-scientific staff, and at the same time, I was volunteering in my children’s classrooms, where I discovered that I loved teaching children. So, I left biotech and founded a science education company, which took me into K-8 classrooms teaching workshops with the primary mission of making science fun and assessible. When I was given the opportunity to do a long-term subbing position… I discovered that I loved being with the same kids day-in-and-day-out, seeing their growth over time, and building personal relationships and watching them discover science is kind of fun. Why did you decide to teach at Westridge? In my husband’s words, “the mothership has called me home.” I love the philosophy of Westridge. I love the fact that I am free to teach science as a process, as a skill set for how to solve problems – a skill set applicable to everyday life. I am more concerned with the girls learning how to ask questions and how to problem solve than memorizing facts. I want them to understand theory and have problem solving abilities. And Westridge has that, not just in science, but across the board. Science teachers collaborate across divisions and across subjects. The other thing that I really like about Westridge is that students are put first in every decision. This school embodies everything I love about learning and education. After earning her master’s degree in biological anthropology from UCLA, Tracy worked as a bench scientist conducting molecular genetic research and writing grants at the Jules Stein Eye Institute, before moving to QIAGEN, Inc, a global biotechnology company, where she established and ran their North American Training Department. She founded Science a la Carte, a science education and training company that for 12 years provided K-8 students with hands-on classroom workshops and science kits, which led her to a year-long, substitute teaching assignment at Polytechnic Middle School before coming to Westridge in 2016.